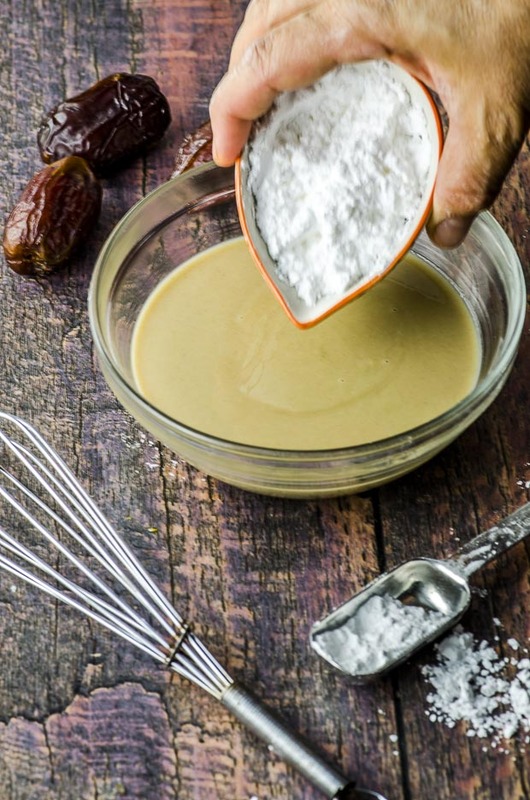 This deliciously decadent and oh-so-easy Halva Stuffed Date recipe can be served with afternoon tea, as a side dish, or as the most enchanting Rosh HaShanah dessert for the Jewish New Year. 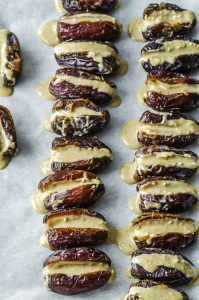 We love stuffed dates for the incredible punch of sweet and fabulous flavor that they deliver in bite-size portions. 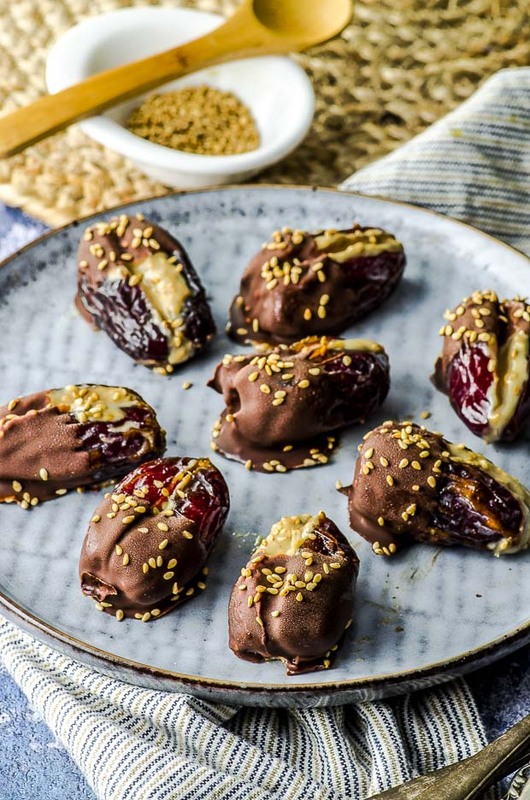 Plus, we love the fact that whenever we serve our Halva Stuffed Dates, a chorus of oh’s and ah’s emanate from the table right after the very first bite. 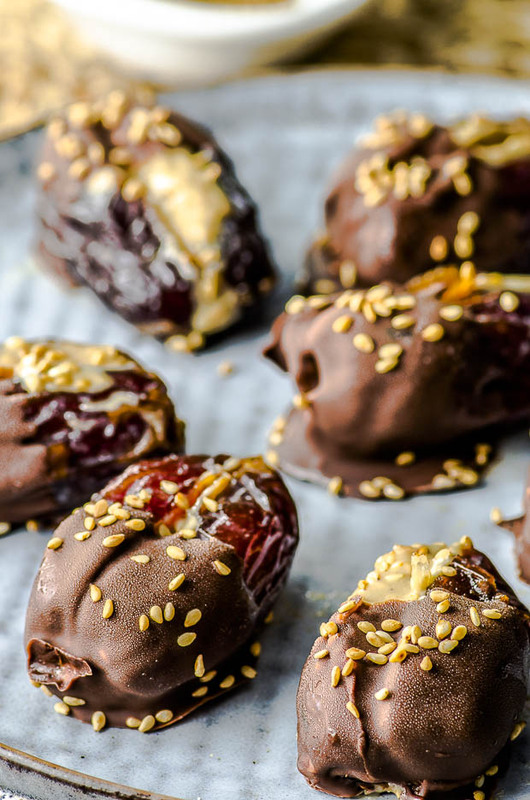 You’ll have the same effect on your guests with these chewy, chocolate-covered stuffed dates that take minutes to prepare with just a simple handful of ingredients. Our Halva Stuffed Date recipe features tahini, powdered sugar, and roasted sesame seeds blended into a delicious cream filling. 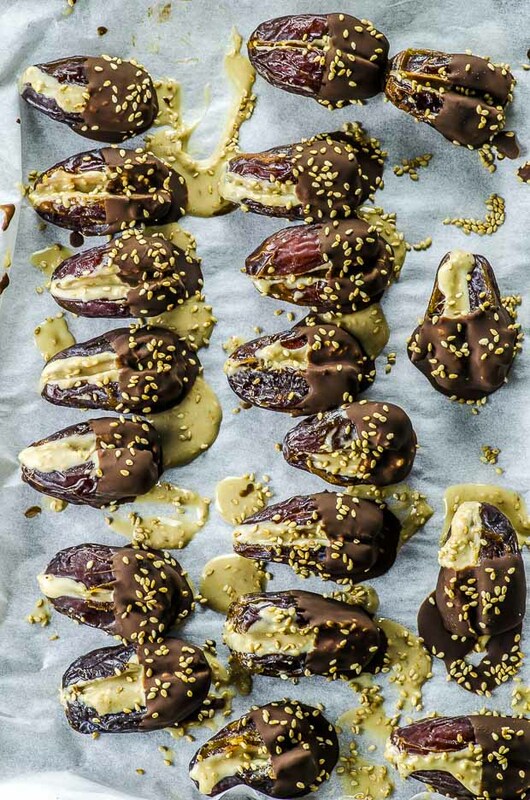 Once the halva mixture is blended and the dates are stuffed, we freeze them before dipping half in dark chocolate and a sprinkling of sesame seeds. We then return the dates to the freezer until ready to serve. 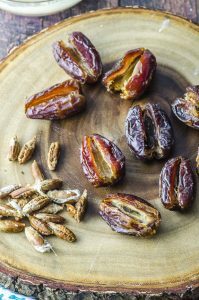 Freezing gives the stuffed dates a wonderfully chewy texture because the natural sugars in the fruit prevent them from hardening when frozen. 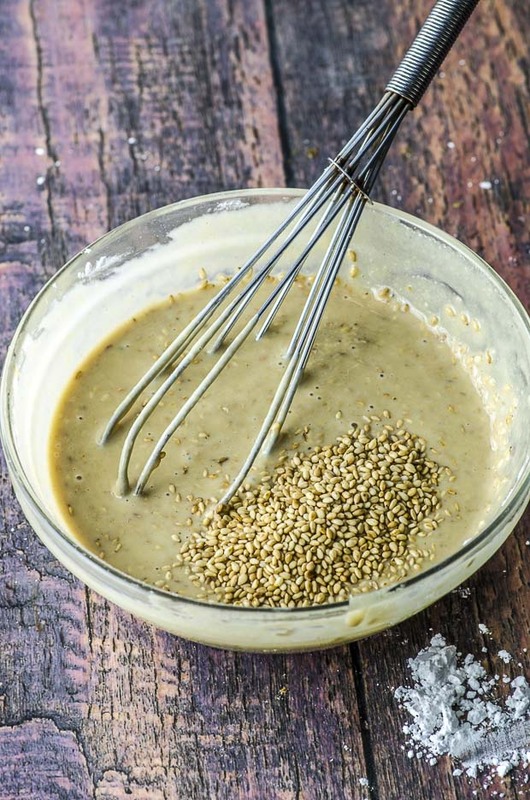 What’s great is that you can always have a batch on hand for easy meal planning or last-minute special occasions! We have collected a great variety of Middle Eastern-style gold-leafed glass dishes that make a beautiful serving tray for the Stuffed Dates. Any serving piece will do, though, and we encourage you to serve the dates alongside rows of plain dried fruit like apricots, figs, pears, or apples; a small dish of pistachios, and a pot of mint tea. 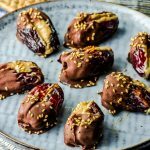 Did you like this stuffed dates recipe? Leave us a rating! This deliciously decadent and oh-so-easy Halva Stuffed Dater ecipe can be served with afternoon tea, as a side dish, or as the most enchanting Rosh HaShanah dessert for the Jewish New Year. 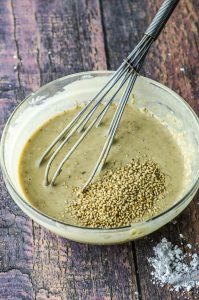 Cardamon adds a wonderful, sort of flowery taste to the tahini. 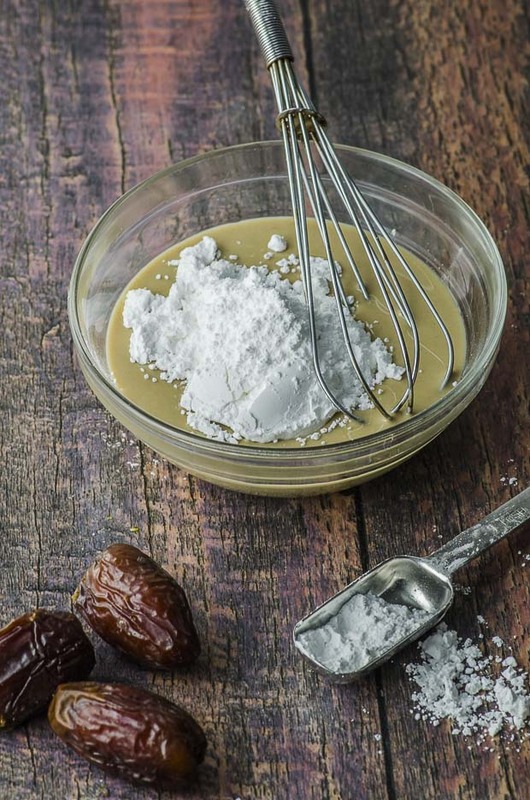 However, it has a powerful assertive flavor, so use it sparingly. If you’re not familiar with it, we recommend that you taste it first.